I had the pleasure of talking with White Collar stars Matt Bomer (Neal) and Tim DeKay (Peter). We talked about what they took from the set, bromance and a possible movie. Go ahead and read the full interview below. Question: (Tim) Anything you can tell us about the series finale? Tim: We've got some great twists and turns, some wonderful moments between everybody. And I think it fits on all the tones that have made White Collar what it is.There is a great familial sense to this episode, certainly the caper or the heist I should say in this instance is wonderful. And many questions that people have had throughout the seasons about White Collar will be answered. Question: (Tim) Is there anything you took with you from the set? Tim: Yes. I took home - let's see. There were two badges that Peter Burke had. I took home one. I took home a number of suits because they were just - they were - these suits were built for me by a great different tailors, special tailors. And then there was a painting that was in the hallway. I don't think anybody has ever seen it. I don't think it ever aired, a side of the painting maybe. But there was a painting in the hallway, the little vestibule before you entered Neil's apartment and it - Neil and Mozzie had a - had this scene and I entered halfway through the scene or I was just waiting in that vestibule for my cue to enter. I would always look at this one painting and it's a great painting of this couple in a horse drawn sleigh in the snow. And short - like within the first few episodes of the first season I thought I'm going to take this home when this show ends because I like it. So I did. Question: (Tim): Will there be a 'White Collar' movie or prequel? Tim: I don't know. That's a good question. I think in the past I would have said no I don't see that being a possibility but Veronica Mars kind of broke the mold with that. So I- I'm not going to say that's-it would be impossible. I certainly would entertain that possibility, but right now there aren't any plans to have a movie. Gosh that would be fun. Question: (Tim): What was it like filming the last few scenes? How would you describe the last day on set? It was similar to senior week in high school. But yet I don't know if you remember but maybe you didn't. But it was senior week but yet you had a whole bunch of finals still. You still had to do well in the classroom and those were the scenes and you wanted to do well. So but what was interesting was that every time somebody would finish let's say Marsha Thomason-Sykes for example. She finished a couple days before Matt and I did. And in the past you all - the first AD always makes an announcement ladies and gentlemen that's an episode wrap on this person and then the whole crew applauds. For every episode it's a nice tradition that television has. In this instance the first AD would say ladies and gentlemen that is a series wrap on Marsha Thomason on, you know, Sharif Atkins, whomever. And then of course the tears would start flow and each actor was aloud as they wanted to somewhat publicly thank the cast and crew and just share what the series meant to them. So that was lovely. It was just and as I said they saved the last part for - last shot of the series scene between Matt and me and we both got to speak and we were all - everybody was crying. And then they brought out a cake and it was lovely because the cast and crew became such a family. And it was just a joy to go to work. Question (Tim): Any types of roles you're looking to do? Are you trying to kind of veer away from procedural stuff? Or what's on your list moving forward? Well I've done a few - I've done a holiday movie, a Christmas movie that I'm trying to get made that I would be directing in it. And I've also been talking to Fox Studios because they have some projects that they would like me to pursue as well with them for television as an actor which are very interesting. So I have those and also there's a western that I will be shooting this spring where I play it's a dark character. And I look forward to playing somebody dark and not quite. And it's - he's certainly not an FBI agent. Far from it. It's - so I, you know, as an actor you always look for something where the character is great or the story is great. And some of these projects I've got coming up they're both. So while I will miss Peter - playing Peter greatly I look forward to different kind of roles. Question: (Tim and Matt) Why do you think Neal and Peter were such a successful partnership? Tim: No because of Matt Bomer. His spirit and his kindness and his grace. I think honestly the key to Neal and Peter certainly it started with the writing. Jeff Eastin wrote these great guys and I - I'll say that I - Matt and I work extremely well together and we respect each other and we listen to each other and we - I think the fun that we have, Matt and Tim have, working together comes across as Peter and Neal having a good time working together as well. Matt: Yes. I agree with - I echo everything Tim said. It really did start with the writing and I knew from the first time that Tim and I read together that we had somewhat of an understanding of the yin and yang of these two people and what - not only what made them different but what made them want to be the same in certain ways. We were lucky enough to have Jeff who was willing to listen to us and we were able to listen to him and just bounce ideas off of each other and get to riff on those things. And then I think we just had a blast doing it together. Question: (Matt) How satisfied are you with the series finale? Matt: I mean that's a complicated question because you're wrapping up so many things in such a period of time. But I would say - you want me to give you a percentage value? I, you know, that's a hard question to answer. I was really--satisfied in some ways and in some ways I would have been interested to explore other avenues as well. I mean I think there was still directions to go. But I think the way they wrapped it up was really well done in the sense that they didn’t try to tie everything up into a nice bow. They really left some things open ended and left a lot up the viewer's imagination which I always think is more potent than anything you could put down on a piece of paper. Question: (Matt) What was it like on set filming the last day. What was the experience like--how it felt? Matt: It was really emotional. I think and I'm so glad that I think most of us if not all of us were able to process a lot of that in the moment as opposed to just finding yourself driving down a street in LA five months later and, you know, bursting into tears. But it was great. I’m so grateful. It's so easy to focus on how much we'll miss everybody and I will but I just feel like we're all so lucky that we got to do this for six seasons and get to enjoy each other's company for that time and make a lot of relationships. Business relationship and friendships were created that will last a lifetime. So I think there's a lot more to be grateful for then there is to be sad about. Question: (Matt) Any upcoming project that you're working on in the next few years? Matt: Oh goodness. There's so many things I want to do. You know, I'd like to really make the Montgomery Cliff bio pic happen. I'd like to, you know, get a chance to wear two different hats in the business. And I also think it'd be really great to do an adaptation of a great novel,those are pretty countless. But so any and all of the above. 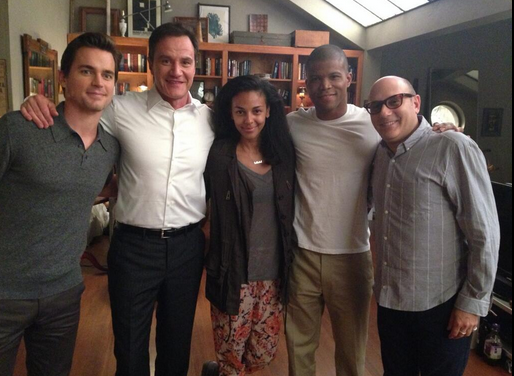 Question (Matt): Overall, what will you miss most about 'White Collar'? Matt: I would say personally I'll really miss the camaraderie that we all had on set. Professionally I'll miss getting to play such a rich character and selfishly I'll miss getting to wear all those great suits. Question (Matt and Tim): You both had input in the finale, how did that come to be? And how much input did you have? Tim: We didn't really brainstorm. It's not as if I don't think the two of us ever sat down and said hey how are we going to end this. Because, actually you don't ever want to think. You don't think that. It was just one of these things that came about. We were on set. I don't remember--but there were some ideas that were thrown around and Jeff seemed to like this one idea which, you know, reflects something that Matt had said earlier that it needs to be noted again how open Jeff Eastin was throughout the process to our ideas and how well he listened whether he listened to our rhythms through Peter and Neal or listened to Tim and Matt. But Jeff was always open to that and not precious with his words but open to the ideas and the rhythms that we would suggest for the show. I think that was a key to the show's success at the beginning. Matt: Yes I echo those sentiments. We heard a lot of ideas being bandied about and we kind of threw in our two cents and it ended up becoming kind of a soup that everybody had thrown a few ingredients into. So I don't think Tim or I could take any personal or professional responsibility for it but they were definitely open to our input. Question: Did anything special happen the last day on set? Tim: They brought out a - a big cake. They brought out this gorgeous cake and black and white and blue icing and it was nice because they scheduled it so that the two of us had a final scene together. It wasn't the last scene of the episode certainly as you will see but it was an episode - actually it was a scene that was already - that's already aired. Matt: We also were able to give wrap speeches and express our gratitude to our amazing crew and fellow cast members...And just have some closure there. And the, you know, we were able to get our thoughts and thanks all out there. Question: (Matt and Tim) Any favorite episodes? or one that stands out? Matt: Yes it's like asking me which is my favorite finger, you know. We had six years of compiled memories. I mean it's tough to pick one thing. I would say if I had to encapsulate one experience it would probably be the pilot because you have a lot more time and you're establishing all these relationships and everything is so fresh and new. So that was definitely a really magical time--this was just one of those rare jobs where there wasn't a single day that went by that I wasn't enjoying myself. If not the entire day than most of it. So it's impossible to really boil it down to just one episode or one moment. Question: (Matt) What did you take from the set, if anything? Matt: Yes I took a painting of a like harem from Neal's apartment. And what else did I take? I took the bust of Socrates and gave it to Jeff Eastin as a wrap gift. And then I don't remember what else I took...I gave Willie (Garson) the beautiful picture of the preacher skating. It was kind of turn of the century in a top hat just kind of in his own solitary reverie ice skating around a pond by himself and I always very liked that picture. What else did I take? I don't remember...Oh I - yes. I took there's a great antique map of Manhattan that Neal had on his wall and I took that as well. No suits--I think they auctioned them all off to make a dollar and left me in the cold. But over the years I certainly can't complain. I definitely mutilated a few out of Neal's wardrobe. Question: (Matt and Tim) Do you have any message(s) to all the 'White Collar' fans, any parting words? Matt: Oh I think this entire final - look we have the most incredible fans for the show. We really do. I mean we probably had 42 different time slots over the course of six seasons and this incredible group of people stood by us and supported and followed us wherever the network put us on and after they put us on. And their outpourings and expressions of support over the years have really for me bolstered me during difficult times or when, you know, the workload was really intense, I just from through this entire season was for them. And I just hope that they were able to, have some kind of closure with the series and to enjoy these final six episodes.And I just hope that they're happy with the way things turned out. Tim: Yes I share those sentiments as well. What a great group. It's just such a wonderful feeling I get from many of the fans,who have tweeted or Instagrammed or been on the set and shouted out something across the street. They've been incredible and certainly have been a big part of this wonderful journey that we've been on for the last six seasons. Question:(Matt) Do you have any favorite (Neal/Peter) bromance moment? Matt: There's the one moment that really sticks out to me is the finale of the first season and I always thought that the strongest the bromance got when Neal's about to leave and go off with Kate in the airplane. And he's basically saying goodbye to Peter. And in that moment I think he really - he realized that for the first time in his life he had a friendship with someone who was actually remotely stable and had a healthy sense of boundaries and someone who he knew he could learn a lot about being a good human being from. And which is an experience I don't think he got with a lot of people in the world. And so that moment was probably my favorite bromance moment to play. Question: (Matt) Do you think there will be a 'White Collar' movie at some point? Matt: Oh that's way above my pay grade. I mean honestly if they came to us with the proposition then I would definitely want to do it just to get the chance to work with Tim and Willie and Marsha and Sharif and Tiffany again. But, you know, I have no idea. Loved the interview? Leave your comments. Thanks.